There’s a new web service called dipity that creates timelines of your events. You can see a quick timeline I created below using the services (blog, Flickr, Yelp, etc) that I commonly use. It’s a nice visual way to see what someone has been doing. It offers Twitter integration as well, but I found that it cluttered up the timeline. I think it has potential, but there are other things I’d like for it to do. For instance, I think it would make a great “Archive” page for your blog. However, it only imports blog posts via RSS feed. Meaning it will show the most recent posts only. I tried to create a custom RSS page and use that, but it would bomb out at more than 20 results. So go try dipity and see what you think. I’ll keep watching to see if you can import older content. I’ve never been to Isotope Comics in SF, but I’ve heard about it from many different places. Owner James Sime has created a shop that caters to comic fans and promotes a community, not a run in, get your books and leave type shop. Just look at the amount of light in this photo. Have you even seen that much light in your average comic shop? The reason this photo is the best and proves that Isotope is tops. 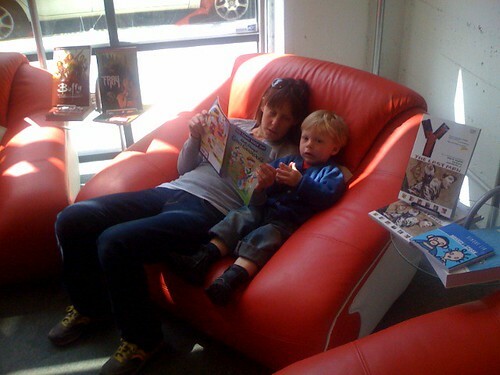 Parent and kid reading a comic together in the shop. That’s perfect. The great thing is that more and more publishers are beginning to offer new content (or #1 issues) in the free books, rather than reprinting old material. 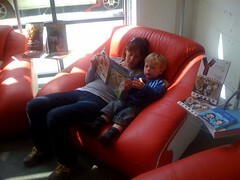 That not only entices existing readers to try new books, it makes a perfect starting place for all new readers. For more information (and previews) of all these books — and more — visit the Free Comic Book Day site. Be sure to get out there, get some free reading material and enjoy. Posted a feature over on Superheroes-R-Us about the Top 10 Villains in Iron Man 2. Go check it out. Iron Man is no doubt going to be a hit and a sequel will definitely follow (rumored for 2010). Iron Man has a great rogues gallery and there are a few standouts that should make it into the next movie. Who are they? Letâ€™s take a look at the Top 10 Iron Man 2 Villains. This R2-D2 Video Projector is insanely priced ($2995), but it’s still very cool looking and functional. Click the image above to watch a nice demo video and visit the StarWarsShop if you want to order one for yourself (or if you want to order me one).